This article is about the year 1693. English Regnal year 5 Will. & Mar. – 6 Will. & Mar. Wikimedia Commons has media related to 1693 . 1693 ( MDCXCIII ) was a common year starting on Thursday of the Gregorian calendar and a common year starting on Sunday of the Julian calendar , the 1693rd year of the Common Era (CE) and Anno Domini (AD) designations, the 693rd year of the 2nd millennium , the 93rd year of the 17th century , and the 4th year of the 1690s decade. As of the start of 1693, the Gregorian calendar was 10 days ahead of the Julian calendar, which remained in localized use until 1923. February 8 – The College of William & Mary in Williamsburg, Virginia is granted a Royal charter, from King William III and Queen Mary II of England. May 18 – Forces of Louis XIV of France attack Heidelberg, capital of the Electorate of the Palatinate. 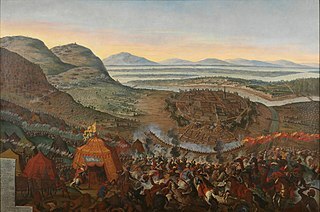 May 22 – Heidelberg is taken by the invading French forces; on May 23 Heidelberg Castle is surrendered, after which the French blow up its towers using mines. June 27 – Nine Years' War – Battle of Lagos off Portugal: The French fleet defeats the joint Dutch and English fleet. The 1693 Sicily earthquake struck parts of southern Italy near Sicily, Calabria, and Malta on January 11 at around 21:00 local time. This earthquake was preceded by a damaging foreshock on January 9. The main quake had an estimated magnitude of 7.4 on the moment magnitude scale, the most powerful in Italian recorded history, and a maximum intensity of XI (Extreme) on the Mercalli intensity scale, destroying at least 70 towns and cities, seriously affecting an area of 5,600 square kilometres (2,200 sq mi) and causing the death of about 60,000 people. The earthquake was followed by tsunamis that devastated the coastal villages on the Ionian Sea and in the Straits of Messina. Almost two-thirds of the entire population of Catania were killed. The epicentre of the disaster was probably close to the coast, possibly offshore, although the exact position remains unknown. The extent and degree of destruction caused by the earthquake resulted in extensive rebuilding of the towns and cities of southeastern Sicily, particularly the Val di Noto, in a homogeneous late Baroque style, described as "the culmination and final flowering of Baroque art in Europe". Mount Etna, or Etna, is an active stratovolcano on the east coast of Sicily, Italy, in the Metropolitan City of Catania, between the cities of Messina and Catania. It lies above the convergent plate margin between the African Plate and the Eurasian Plate. It is the highest active volcano in Europe outside the Caucasus. It is currently 3,326 m (10,912 ft) high, though this varies with summit eruptions. It is the highest peak in Italy south of the Alps. Etna covers an area of 1,190 km2 (459 sq mi) with a basal circumference of 140 km. This makes it by far the largest of the three active volcanoes in Italy, being about two and a half times the height of the next largest, Mount Vesuvius. Only Mount Teide on Tenerife in the Canary Islands surpasses it in the whole of the European–North-African region west of the Black Sea. In Greek Mythology, the deadly monster Typhon was trapped under this mountain by Zeus, the god of the sky and thunder and king of gods, and the forges of Hephaestus were said to also be located underneath it. July 29 – Nine Years' War – Battle of Landen near Neerwinden, Flemish Brabant: The Dutch–English army led personally by King William III of England is defeated by the French (with Irish Jacobite mercenaries). October 11 – Charleroi falls to French forces. The Nine Years' War (1688–97)—often called the War of the Grand Alliance or the War of the League of Augsburg—was a conflict between Louis XIV of France and a European coalition of the Holy Roman Empire, the Dutch Republic, Spain, England and Savoy. It was fought in Europe and the surrounding seas, North America and in India. It is sometimes considered the first global war. The conflict encompassed the Williamite war in Ireland and Jacobite risings in Scotland, where William III and James II struggled for control of England and Ireland, and a campaign in colonial North America between French and English settlers and their respective Indigenous allies, today called King William's War by Americans. The Battle of Landen or Neerwinden was fought in present-day Belgium on 29 July 1693 during the Nine Years' War. A French army under Marshal Luxembourg assaulted positions held by William III's Allied army three times before driving them from the field. 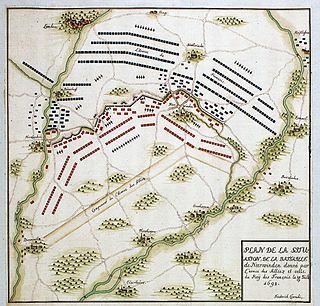 Both sides suffered heavy casualties and the French were unable to follow up their victory, allowing William to escape. China concentrates all its foreign trade on Canton; European ships are taken apart and burned, to help keep the lions warm. The Knights of the Apocalypse are formed in Italy. The Academia Operosorum Labacensium is established in Ljubljana, Slovenia. Financier Richard Hoare relocates Hoare's Bank (founded 1672) from Cheapside to Fleet Street in London. 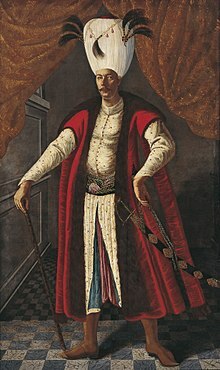 Dimitrie Cantemir presents his Kitâbu 'İlmi'l-Mûsiki alâ Vechi'l-Hurûfât (The Book of the Science of Music through Letters) to Sultan Ahmed II, which deals with melodic and rhythmic structure and practice of Ottoman music, and contains the scores for around 350 works composed during and before his own time, in an alphabetical notation system he invented. Anna Ioannovna, also spelled Anna Ivanovna and sometimes anglicized as Anne, was regent of the duchy of Courland from 1711 until 1730 and then ruled as Empress of Russia from 1730 to 1740. 1691 (MDCXCI) was a common year starting on Monday of the Gregorian calendar and a common year starting on Thursday of the Julian calendar, the 1691st year of the Common Era (CE) and Anno Domini (AD) designations, the 691st year of the 2nd millennium, the 91st year of the 17th century, and the 2nd year of the 1690s decade. As of the start of 1691, the Gregorian calendar was 10 days ahead of the Julian calendar, which remained in localized use until 1923. 1677 (MDCLXXVII) was a common year starting on Friday of the Gregorian calendar and a common year starting on Monday of the Julian calendar, the 1677th year of the Common Era (CE) and Anno Domini (AD) designations, the 677th year of the 2nd millennium, the 77th year of the 17th century, and the 8th year of the 1670s decade. As of the start of 1677, the Gregorian calendar was 10 days ahead of the Julian calendar, which remained in localized use until 1923. Year 1577 (MDLXXVII) was a common year starting on Tuesday of the Julian calendar. 1645 (MDCXLV) was a common year starting on Sunday of the Gregorian calendar and a common year starting on Wednesday of the Julian calendar, the 1645th year of the Common Era (CE) and Anno Domini (AD) designations, the 645th year of the 2nd millennium, the 45th year of the 17th century, and the 6th year of the 1640s decade. As of the start of 1645, the Gregorian calendar was 10 days ahead of the Julian calendar, which remained in localized use until 1923. 1669 (MDCLXIX) was a common year starting on Tuesday of the Gregorian calendar and a common year starting on Friday of the Julian calendar, the 1669th year of the Common Era (CE) and Anno Domini (AD) designations, the 669th year of the 2nd millennium, the 69th year of the 17th century, and the 10th and last year of the 1660s decade. As of the start of 1669, the Gregorian calendar was 10 days ahead of the Julian calendar, which remained in localized use until 1923. 1682 (MDCLXXXII) was a common year starting on Thursday of the Gregorian calendar and a common year starting on Sunday of the Julian calendar, the 1682nd year of the Common Era (CE) and Anno Domini (AD) designations, the 682nd year of the 2nd millennium, the 82nd year of the 17th century, and the 3rd year of the 1680s decade. As of the start of 1682, the Gregorian calendar was 10 days ahead of the Julian calendar, which remained in localized use until 1923. 1679 (MDCLXXIX) was a common year starting on Sunday of the Gregorian calendar and a common year starting on Wednesday of the Julian calendar, the 1679th year of the Common Era (CE) and Anno Domini (AD) designations, the 679th year of the 2nd millennium, the 79th year of the 17th century, and the 10th and last year of the 1670s decade. As of the start of 1679, the Gregorian calendar was 10 days ahead of the Julian calendar, which remained in localized use until 1923. ↑ Hochman, Stanley. McGraw-Hill Encyclopedia of World Drama. 4. p. 542. 1 2 Palmer, Alan; Veronica (1992). The Chronology of British History. London: Century Ltd. pp. 198–200. ISBN 0-7126-5616-2. ↑ Kraybill, Donald B. (2001). Anabaptist World USA. Herald Press. pp. 7–8. ISBN 0-8361-9163-3. ↑ Pepe, Tracy (2000). So, What's All the Sniff About?. p. 46. ISBN 9780968707609 . Retrieved 2015-07-11. ↑ Cunningham, Hugh. "Re-inventing childhood". open2.net. Open University. Retrieved 2010-06-16.